Yummy! Very delicate, mouth-watering and heavenly light (at least that’s the impression without looking at the calories ;)). I wanted to make it for a long time but always some ingredient was missing. Finally I made it and it was sooooo tasty. The recipe comes from my guru’s book Dorota Swiatkowska (yes, after writing a culinary blog you can actually publish a book ;)) called “Moje Wypieki” (My baking). Totally worth trying! Separate egg whites from egg yolks. Beat the egg whites until stiff. Add sugar and keep beating. Add egg yolks, one by one and continue. Add both flours mixed with baking powder, cooled coffee and mix gently. Line baking tray (28 x 34 cm, closest to square you can get) with baking paper, pour the biscuit mass, smooth it our with a spoon and bake for 8 minutes at 190°C. Sprinkle vanilla sugar on a kitchen cloth. Put on it baked biscuit, paper to the top, remove the paper and roll it with the cloth. Leave it to cool down. All the ingredients for the cream pour into a high pot and beat until your mixer will leave sharp tracks of the mixer’s spoons. 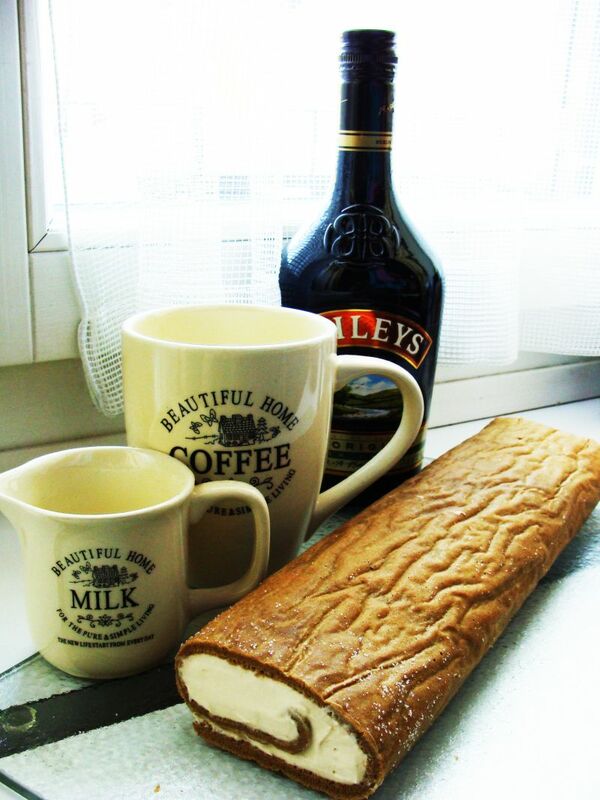 Open the cooled roulade, spread the cream and roll it again. Refrigerate and store in the fridge.